Paul LaRue presents his program, “Searching for Homer Lawson: Ohio’s African American World War I Veterans,” to the Fayette County Genealogical Society. The banner of the 372nd US Infantry, made up of African-American WWI soldiers, who served in France. On Monday, March 19, the Fayette County Genealogical Society opened its 2018 season with a well-attended and well-received presentation, “Searching for Homer Lawson: Ohio’s African American World War I Veterans,” by Paul LaRue. Paul, a retired social studies teacher from the Washington City Schools, has been the recipient of numerous state and national teaching awards. Best known for his work getting students out into the community for “hands on” history, Paul serves as a member of the Ohio World War I Centennial Committee and the National World War I Centennial Committee as a senior education advisor. Paul spoke on the sacrifices made by African-American soldiers during World War I and how their contributions to this military conflict were not readily recognized. 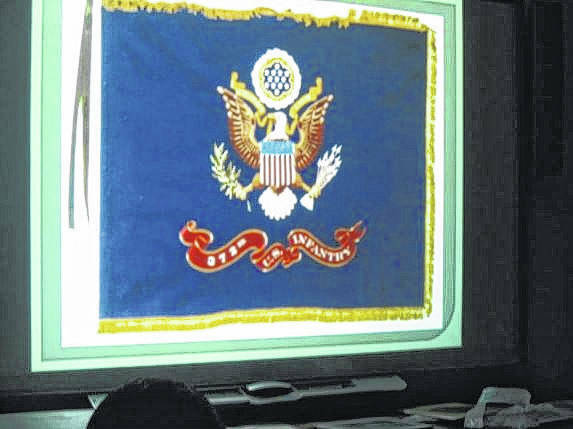 Pictures were shown throughout the program, which depicted the banners of the African-American troops and the areas these soldiers served in Europe, mostly with French forces, even though they were Americans. At the time of World War I, discrimination was prevalent in American forces, but the French were used to serving with black soldiers because of their colonial history. Many ties to Fayette County of the contributions made by African-American soldiers were brought to light during this well-presented program. The Society and its guests hope Paul will return for other such programs. The Society is continuing its veteran work this season documenting all deceased veterans of Fayette County and their stories. The country is observing the 100th anniversary of World War I and the society wants to make sure all WWI veterans of Fayette County are included in this book. Please contact the Society with any information you may have of any Fayette County deceased veterans. The contacts are suegilmore@yahoo.com, Glenn Rankin at eaglescout303@yahoo.com, or Cathy Massie White at ReunionMassie@yahoo.com. The veteran theme will continue at the next meeting of Fayette County Genealogical Society on Monday April 16. David Tillis, a resident of Ross County and an early American history enthusiast, will present a program describing the military career of Col. Webb Cook Hayes. James Webb Cook Hayes, he dropped his first name James early in his life, was the second son of President Rutherford B. Hayes and Lucy Webb Hayes. His mother, First Lady Lucy Webb Hayes, was born and lived in Chillicothe. Col. Hayes grew up to become a businessman, soldier, philanthropist and historian. As a soldier, Col. Hayes participated in nearly every major American conflict from the Spanish-American War to World War I, including the Philippine Insurrection, the Boxer Rebellion, and the Russo-Japanese War. He was awarded the Medal of Honor for his bravery in the Philippine conflict. Col. Hayes was the guiding force behind the presentation of his parents’ estate at Spiegel Grove in Fremont, Ohio to the State of Ohio as the nation’s first Presidential Library in 1916. David Tillis is the president of the Bainbridge Historical Society in Ross County and is active in the programs and preservation of the Lucy Hayes House in Chillicothe. He is the author of books on early Ohio history and portrays several of the famous historic figures in Ohio history in authentic costume while telling the story of their lives in other presentations. Please join David and the Society this Monday, April 16 for the details of Col. Webb Cook Hayes. The program will begin at 7 p.m. in the meeting room at Carnegie Public Library, 127 S. North St., Washington Court House. Please enter the building through the doors on the Catholic Church side. If you have any questions concerning the Fayette County Genealogical Society and membership, contact Cathy Massie White at 740-333-7227 or ReunionMassie@yahoo.com. 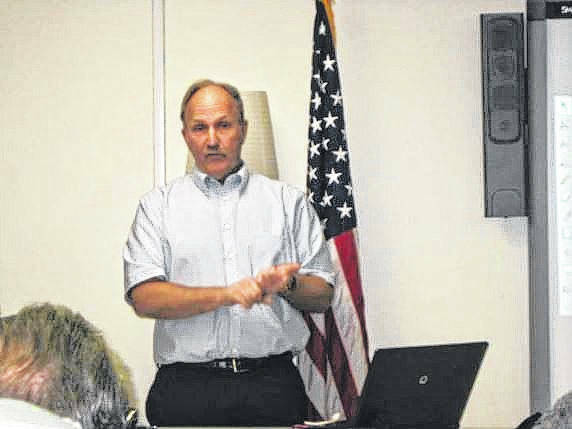 https://www.recordherald.com/wp-content/uploads/sites/27/2018/04/web1_PaulLaRue.jpgPaul LaRue presents his program, “Searching for Homer Lawson: Ohio’s African American World War I Veterans,” to the Fayette County Genealogical Society. https://www.recordherald.com/wp-content/uploads/sites/27/2018/04/web1_American.jpgThe banner of the 372nd US Infantry, made up of African-American WWI soldiers, who served in France.